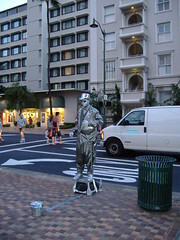 I think everyone has seen a street performer painted in metal and dressed in clothes with a metallic-looking surface. I’ve seen them in Miami, Vegas, and Fort Lauderdale. But only in Honolulu have I seen three of them on the same street only a block from each other. 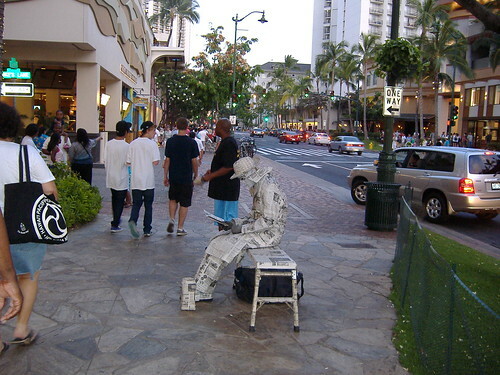 At first when I saw the guy in the newspaper clothing I thought that was pretty creative. But then I saw the metallic guy just a block over. 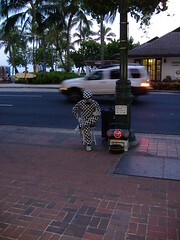 And after that I saw the guy in the “ska” checker board suit. Definitely some points are due for them not all looking the same. But are there really that many people who want a photo with a metallic man that they will take three such photos? This guy was just a block over from the other metal guy. He was blaring a stereo, but was also ready for photogrphs. 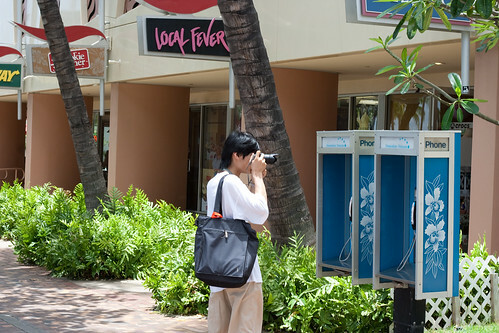 The weirdest thing about Waikiki that I didn’t capture on camera this time or my last time there is the sheer number of people on the sidewalk handing out ads to entire people to all sorts of things from seedy women to gun parlours. It was definitely worse than walking through Ho Plaza on Cornell’s Campus. But not by much. Most of the time people leave me alone when I’m walking alone. I think it’s partially because I have headphones on to listen to podcasts as I walk around. It may also partially be because when I’m quickly weaving my way through the crowds, I don’t exactly look inviting. That didn’t stop one guy from standing RIGHT IN FRONT OF ME in an attempt to get punched in the face hand me an ad. I paused for a step and the walked right around him. People tend to interrupt me a lot more when I’m with my wife. Perhaps because we walk at a slower pace or maybe I seem more easy-going when I’m with her. I’m not sure. On my way back from the ramen house where I had dinner, I saw this sunset. I quickened my pace to get back to my room and grab my Canon camera. This photo doesn’t do any justice at all to the beauty of the sunset that day. 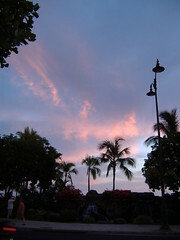 So I vowed to capture the sunset the next day (Hawaii-time) and that’s just what I did. And you’ll get to see it in a future post! 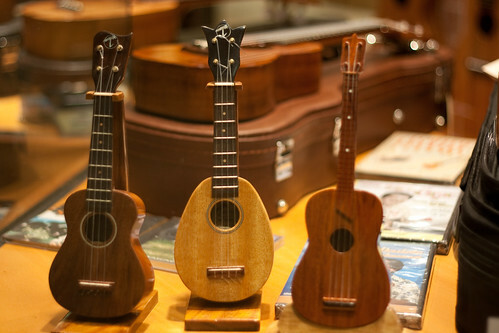 Uncle Bob’s Ukeleles was a shop there in my hotel. 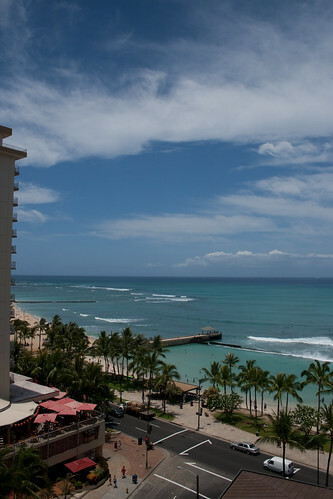 The next day Hawaii time (but same day EST) I took the following shot out of my balcony. Speaking of the balcony, there were scores of birds constantly flying between the balconies to get scraps of what people had left behind. 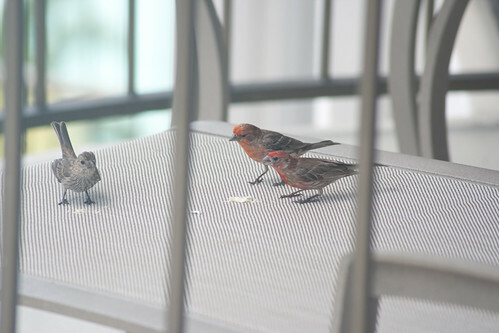 I took this little shot because it looked to me as though the red birds were in a gang and they were telling the brown bird he had better scram. 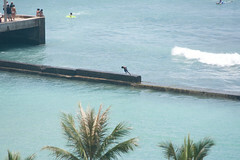 Kids loved to jump off this wall. There was a constant stream of them climbing up to the wall and then jumping off. 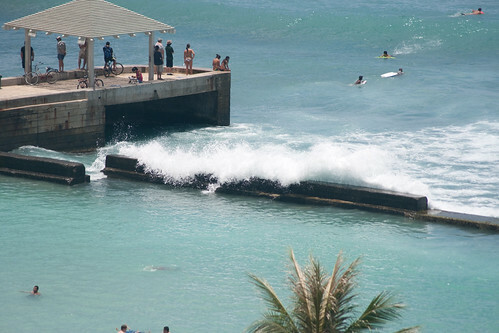 Of course, it was also fun to photograph the waves crashing against the wall. 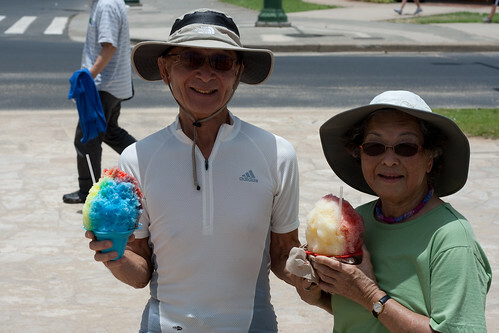 I met the above folks when I saw them with the giant shaved ice treats. I wanted to try and sneak a photo of them, but they came over and started talking to me. So I got over my shyness and asked if I could take a photo of them. It became my favourite photo of the day, so I was quite glad to have asked them. It was the Canon-sponsored Travel Photography workshop I attended that got me into photographing other photographers. I like that it gives an insight into what other photographers find interesting to photograph.